MONTREAL (AP) It was a big night for rookie Anthony Beauvillier and the New York Islanders. 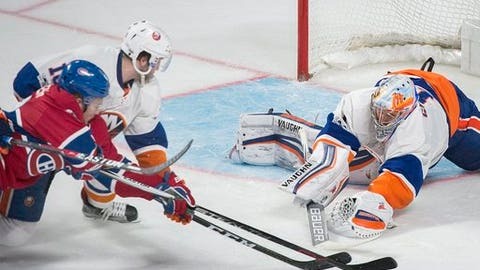 Beauvillier scored in the first period, Thomas Greiss had stopped 24 shots for his third shutout of the season, and the Islanders beat the slumping Montreal Canadiens 3-0 Thursday night. The 19-year-old Beauvillier, who grew up in nearby Sorel-Tracy, had a large group of family and friends on hand for his first game in Montreal. Beauvillier said he bought 19 tickets for the game and several other of his supporters got their own to give the rookie a sizeable cheering section among the sellout crowd. His parents’ emotional reaction to his goal was shown on the scoreboard. Anders Lee scored in the second period and John Tavares added an empty-netter in the final minute to seal the Islanders’ third straight win. New York has won the first two games on a crucial nine-game road swing and improved to 12-4-2 since interim coach Doug Weight replaced the fired Jack Capuano. ”Pretty good from the drop of the puck,” Tavares said. ”We didn’t give them a lot. Josh Bailey and Brock Nelson each had two assists, and Greiss got his third shutout of the season. Carey Price finished with 21 saves as the Canadiens lost coach Claude Julien’s 1,000th NHL game. Montreal is 1-2-0 since Julien replaced Michel Therrien last week and has totaled just 14 goals while going 2-7-1 in the last 10 games, including four shutouts. Instead of a pregame ceremony to mark Julien’s milestone, a prerecorded video of the 56-year-old receiving a commemorative medal from team president Geoff Molson was played early in the first period on the scoreboard, drawing a standing ovation. ”It’s more my personality,” he said. ”It’s great that I’ve had 1,000 games, but I didn’t want to be the center of attention. Julien cited his team’s poor puck management and execution for the lack of offense, although the Canadiens picked up the pace in the third period. They will need to be better on Saturday when they visit the Maple Leafs. ”In order to have an identity, you need consistency and we haven’t had that in the three games that I’ve been here,” Julien said. The Islanders owned the puck early and got the opening goal when Brock Nelson fed Beauvillier, who is from nearby Sorel-Tracy and was playing in Montreal for the first time, on the left side for a shot that beat Price to the near post at 5:28. Lee made it 2-0 at 5:58 of the second when he sneaked behind Alexei Emelin to take a pass from Bailey and score his 23rd of the season with a nifty shot from in close. Montreal had a goal disallowed at 6:50 of the third when both Tomas Plekanec and Paul Byron reached for the puck with high sticks on a shot by Shea Weber. Another was waived off at 7:46 because Artturi Lehkonen put it in with a hand. NOTES: The Islanders were without C Casey Cizikas (upper body) and RW Cal Clutterbuck (lower body), who were injured in a 3-1 win Tuesday over Detroit. … New York won consecutive road games for the first time this season. … Julien got a standing ovation from the sellout crowd during a video segment in the first period honoring his milestone game. … Price remained tied with Ken Dryden with 258 career wins, third all-time on the Canadiens. … Montreal has not won back to back games since Jan. 3 and Jan. 7. Islanders: At Columbus on Saturday. Canadiens: At Toronto on Saturday night.